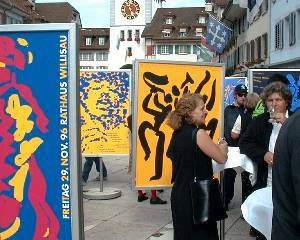 Niklaus Troxler is probably the best known contemporary swiss poster designer, certainly the most highly decorated with international awards. Yet he is a simple man, easy to talk to, with the looks and the wit and the charms of a back country farmer. There are more opposites - not contradictions - united in this man. He lives and works in a small provincial swiss town, but you would think most of his friends are musicians from New York, judged from the number of posters he made for them. Besides beeing a top grade graphic designer, he is also the founder and organizer of a 25 year old international jazz festival in Willisau, and he does both with equal passion and success. Looking at his posters, you find that he masters both ends of a wide spectrum. They are sometimes deceptively simple, clear, even brutally direct, but he also likes to play hide and seek with his spectators who discover figures and meanings in his visual mazes only after closer inspection. Do you see the sax player in the 1993 poster below? Anything else? It is always well worth to take a second look at his works. And have you noticed that this expert typographer is equally at ease in creating posters where text plays an almost negligible role? Or that orgies of color follow stark black and white designs, without any difference in impact? Or that some posters look like wild eruptions of an artist gone mad, while others reveal a carefully constructing craftsman ballancing color and form. The miracle is that they are all in the same style. This book is a review of Troxlers graphic designs since 1969, closing with the 1999 jazz festival poster. 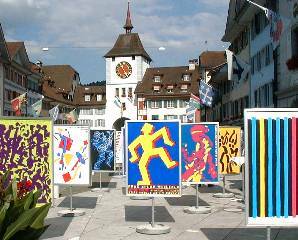 It shows not only jazz posters, as the title may suggest, but other work as well, like cultural posters, and drawings, water colors, scetches for posters, art on architecture, although the emphasis is	clearly on posters. Many of them I have never seen published anywhere else, but his classics are also inlcuded, like the McCoy Tyner Sextet, which has been called "the worlds best typographic poster" - made in pre-Mac time using paper and scissors. I also enjoyed the clear and accurate 10 page essay on Troxler by Dieter Bachmann who obviously knows him well. an honorary citizen and runs his jazz festival. The man at right with the glass is publisher and graphic designer Lars Mueller. All the posters you see here are also in the book.